Glass is one of the best materials to incorporate into your home and interior design. It works well on a variety of surfaces and decor, is extremely customizable and looks great in every home. However, any homeowner who has an abundance of mirrors, glass paneled cabinets and doors, shower enclosures or glass tabletops knows that there is a certain amount of maintenance and care required to keep glass looking great over time. If you have kids, pets or just have a busy lifestyle, you know how easy it is for glass surfaces to collect messes – handprints gather on tabletops and doors, nose prints on windows and toothpaste on mirrors. There are a plethora of glass cleaners available in the supermarket, but that isn’t the only option for keeping your glass clean. The DIY master may try their own newspaper and vinegar treatment for a chemical-free shine. The expert cleaner might invest in one of the special glass-cleaning microfiber clothes to make sure every speck of dust is removed. The options are endless, but be sure to pick a material that won’t scratch your glass, and a cleaner that won’t leave behind streaks. Pro-tip – borrow a page from automotive detailers and the products they use for keeping the inside of windshields looking great. The detailing aisle in your local auto parts store will have glass cleaners you won’t find at the grocery store. Did you know that you can do your own glass-cutting at home? 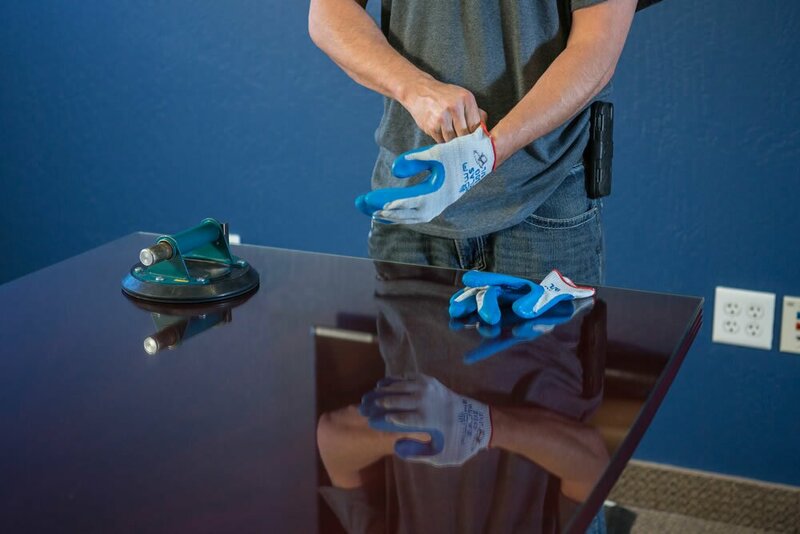 While we don’t recommend attempting larger projects on your own, there are a few ways you can easily trim down a thin mirror or glass panel to fit a new frame without having to call in the professionals. For any glass cutting projects, be sure to always use proper safety precautions. Make sure there are no children or pets nearby, wear gloves, long-sleeve protective clothing and safety goggles, and use a clean, shock-absorbent surface. Next, you’ll want to carefully measure where you plan to cut the glass and mark it thoroughly to avoid making a mistake and wasting material. If you have a glass cutter (you can find one at most hardware stores), you’re ready to go! Tape the glass or mirror to the surface to avoid movement, and score it with the cutter along your measured lines. You should be able to snap the piece away, using the edge of a table or workbench if needed. This is a great method if you have the perfect frame for a too-large mirror, a missing panel in a set of French doors or other small project that requires a custom shape or size. You can often get thin, DIY glass panels or mirrors at your favorite local hardware store. Nothing is worse than seeing a new chip or scratch on your favorite glass table. You can choose to ignore it, but it will likely lead to more damage later on, and will certainly be an eyesore. Just like your car windshield, though, you wouldn’t replace the entire surface because of minor damage – it can be repaired! If you’re not ready to send your glass or mirror off to a professional, there are a few ways to make repairs at home. First, you’ll need to assess the damage. For example: How deep is the scratch or crack? How big is the chip? How large is the glass or mirror you are trying to repair? This is important for determining the repair method you will use. If the issue is too big or complicated, it may be more cost-effective to replace the glass. Smaller items that may be broken all the way through, like decorative glass or bowls, can be repaired with an epoxy kit. These can be purchased in hardware or automotive stores, or ordered online (be sure to check reviews). Before using your kit, make sure to carefully read the instructions to avoid creating a bigger problem. For bigger surfaces like tabletops or shelving, you can also use an epoxy kit. However, larger cracks may still be visible even after making the repair. Epoxy can help hold the piece together or fill in a chip, but it can’t fuse the glass into one seamless piece again. 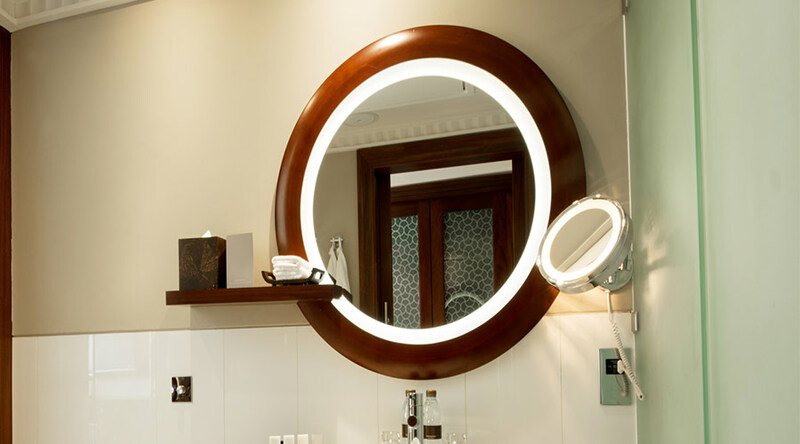 We hope you enjoyed these tips to help your glass and mirrors look nicer and last longer. Don’t let the idea of scratched glass scare you away – glass surfaces and mirrors can help bring more natural light to a home and create a more elegant look. 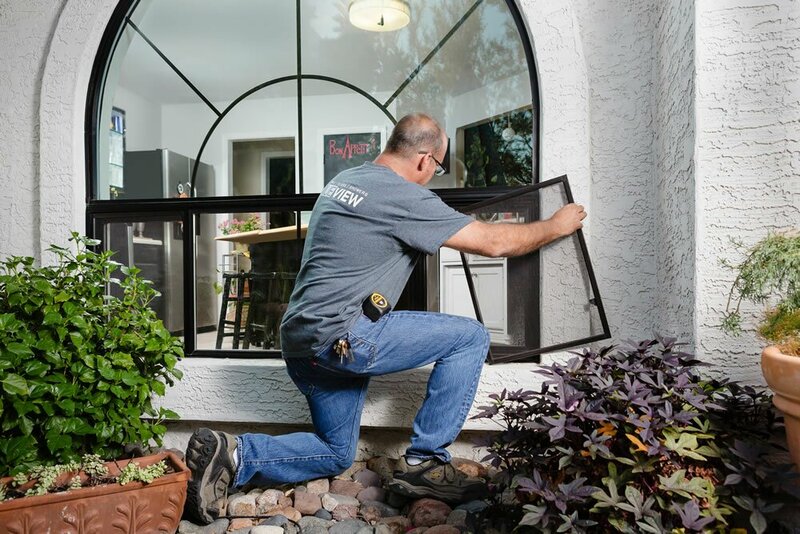 If your glass need is more than a simple DIY project, be sure to call in the experts, like the team at True view Windows & Glass. They can handle the tough jobs for you, letting you focus your time and energy on enjoying the end result! Next PostWhich Is Better: Framed or Frameless Shower Doors?